I'm thrilled to welcome Martin Otto Braun to the salon to life the lid on European nobility and freemasonry, a subject that I have always found fascinating! It is well known that Freemasonry and its lodges played an important role in the convivial gatherings of the 18th century. Not only the bourgeoisie was interested in its secrets and rituals but also European nobility and even kings of the Georgian era. So there is no better place to have a short look at it that in a guest post for Madame Gilfurt’s Salon which focuses on the history of that time. As you might know, the early 18th century is a very important period for the development of the so called modern freemasonry. Of course, thousands of books were written that examine the historical origins of this brotherhood, its secrets and rituals going back to the middle ages. 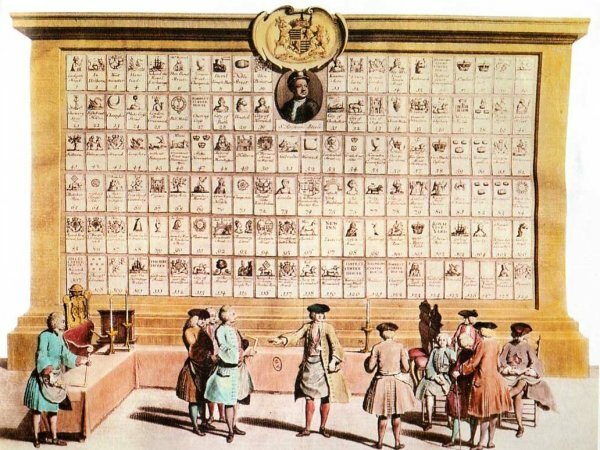 As this is not the place to discuss this topic, I’d like to give you a very short introduction to the history of modern freemasonry in England before turning to a short description of why it became so interesting for the European nobility in this special time. Although reliable documents are missing, the year 1717 is somewhat as the hour of birth of modern freemasonry. In this year four masonic Lodges founded the first Grand Lodge of England in a tavern named Goose and Gridiron in London. A Grand Lodge can be seen as an inner masonic authority which ensures that the masonic rules regarding things like rituals or even the harmonical behavior between the brothers of a lodge are practiced seriously. The first noble Grand Master, John Duke of Montagu, was installed in 1721. Under his protection a very important masonic book was published: the so called Old Charges. The Old Charges are more than a collection of masonic rules for the lodges regulated by the Grand Lodge of England. 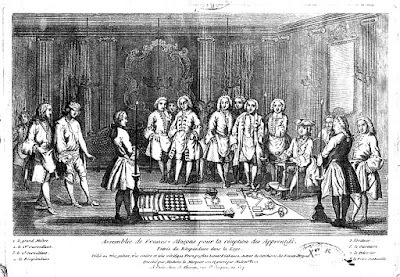 What makes them also interesting for the history of 18th century European nobility and its engagement for modern freemasonry is a fact often mistreated by historians: the mythical elements of its history of freemasonry. Its author, the dissenter-reverend James Anderson, not only tried to examine the history of freemasonry since the creation of the earth with Adam as the first Grand Master of freemasonry. He also described it as a brotherhood which was in all times ruled and protected by wise kings and emperors. Its lodges therefore brought together the best noblemen, clergymen, scientists and craftsmen who worked harmonically and silently on the perfection of mankind through geometry or architecture. This point needs further explanation. As I argued in my doctoral thesis At the roots of virtue. Rhenish nobility and freemasonry 1765-1815 (the book is open access monographie, for English summary see: http://bit.ly/1CR6Ibc) these myths were not that specifically masonic, as it first may seem. They are based upon relatively common beliefs of the people of the early 18th century about the creation and development of mankind – and – much more important especially for noblemen – are based upon the belief about the heredity of virtue through blood. In this belief “pictures of life” were imprinted in one's blood which transferred a part of the soul and of its experiences to next generations. For this reason it became very important to live in a virtuous environment, to be impressed by paintings showing virtues sujets and architectuaral buildings which also communicated through their style such virtues. Even the masonic rituals were believed to be somewhat like performances of virtuous behavior. And of course, as the members of a lodge were “handpicked”, those rituals were excuted in an virtuous environment. 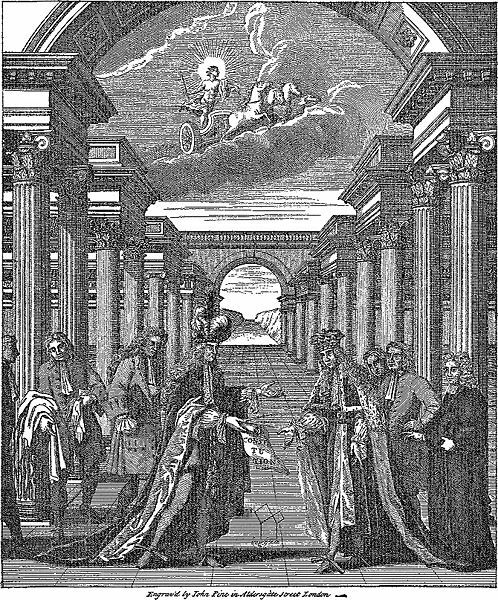 For Georgian nobility Freemasonry therefore became interesting as it seemed to be another place to strengthen one's virtue. And – what is much more important – the virtue of the noble race which govern’d over mankind and guided the later one to perfection by its example. So after showing the reader the history of masonry since the creation of mankind, Anderson spoke about the kings and nobility of England, who promoted the architecture in the virtues Augustan style once again. Of course, the last king he mentioned in this line since Adam was King George. 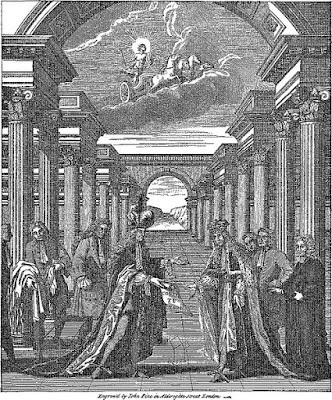 John Montague, 2nd Duke of Montagu presenting the Constitutions and the compasses to Philip, Duke of Wharton. Rev. 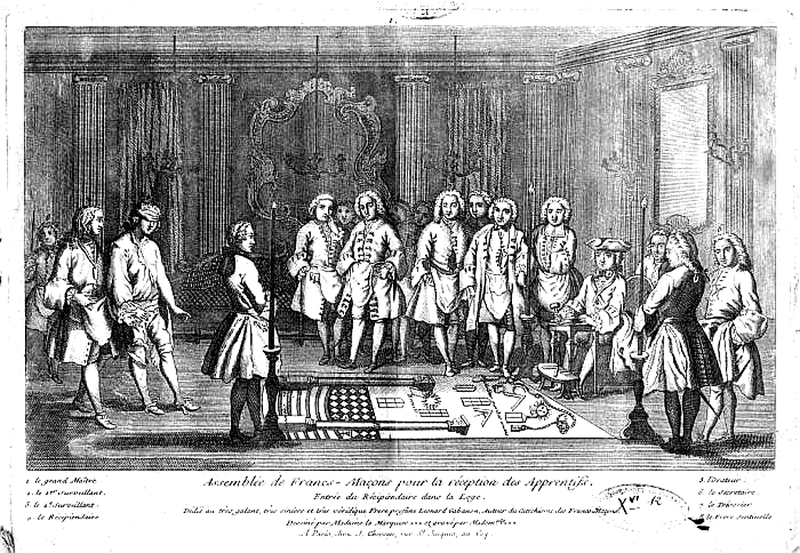 Dr. John Desaguliers at the far right, 1723. King George therefore became, in the views of his contemporaries, the heir and guard of this noble art of freemasonry which guided the mankind to perfection. Though he was not a mason, many of his successors were. Freemasonry became more and more “popular”. In the 18th century thousands of lodges were installed all over Europe and overseas. Many Europeans joined them in order to bring themselves and their heirs closer to perfection. David Stevenson, The Origins of Freemasonry, Cambridge 2011. Martin Otto Braun, An den Wurzeln der Tugend. Rheinischer Adel und Freimaurerei 1765–1815, Köln 2015, DOI: http://dx.doi.org/10.16994/baa. Coronati e.V., Bayreuth), Bayreuth 1968. Written content of this post copyright © Martin Otto Braun, 2015. That's very interesting, the concept that Masonic lodges promoted virtue and essentially moral evolution. Thank you, and may I say how impressive it is to read so learned an article written in a foreign language, especially as English is not an easy language to learn! I know that there is a rather obscure biblical origin to the idea of the mason and his tools, as shown in the Masonic insignia, and rituals. (Martin there are a few errors of English usage in your article, which I'd be happy to point out,if you wish.) English profs can't resist. Sure! You are very welcome. I saw some, too. ;-) Maybe you can sent your corrections directly to Madame Gilfurt. Thanks a lot!